Images from Guimaraes MD, Bitencourt AG, Marchiori E, Chojniak R, Gross JL, Kundra V. Cancer Imaging. 2014;14:18. [Open access.] PMID: 25609051, PMCID: PMC4331823. Death rates from breast cancer in the United States have decreased steadily in women since 1990, thanks to earlier detection and improved treatment modalities. However, nearly 50,000 US female breast cancer-related deaths are still expected annually, and this disease remains the leading cause of cancer death among women worldwide (an estimated 627,000 deaths in 2018). Metastatic breast cancer, also known as stage IV or advanced breast cancer, refers to spread of the disease via the lymph nodes or blood from beyond the breast to distant sites, such as the bones, lungs, liver, brain or skin. This condition is incurable, and the 5-year survival for metastatic breast cancer is about 6%. The axial (A) and sagittal (B) postcontrast T1-weighted magnetic resonance images (MRIs) show breast cancer metastatic to the spine. A bone lesion in the posterior elements of T6 (arrowhead) has high T2 signal intensity and intense contrast enhancement; it is impressing on the spinal canal and displacing the cord anterolaterally (arrow). Image from Subbiah V, Chuang HH, Gambhire D, Kairemo K. Diagnostics (Basel). 2017;7(1). [Open access.] PMID: 28212290, PMCID: PMC5373019. 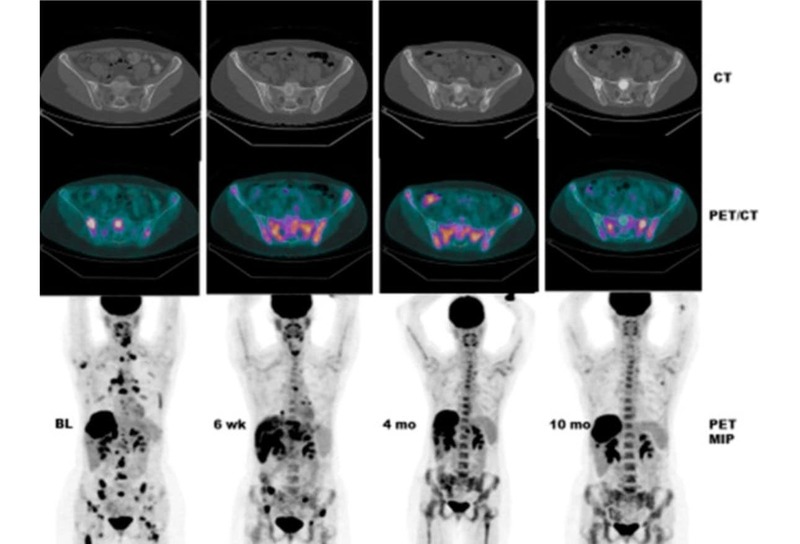 The images shown are pre- and post-fluorodeoxyglucose (FDG) positron emission tomography (PET) scans in a middle-aged woman with metastatic breast cancer and multiple osseous metastases, at baseline (BL) and again at 6 weeks (wk), 4 months (mo), and 10 months after initiation of treatment. At 10 months, new focal sites of activity appeared but without anatomic abnormality. CT = computed tomography; MIP = maximum intensity projection. Image courtesy of Winston W Tan, MD. A 58-year-old cardiac nurse has a history of a 1.2 cm T1c, N0, M0 estrogen- and progesterone-receptor (ER/PR) positive, human epidermal growth factor receptor (HER2) positive (3+ by immunohistochemistry [IHC]) ductal carcinoma. She declined trastuzumab (owing to fear of the risk of congestive heart failure) but received 4 cycles of adriamycin and cyclophosphamide, underwent breast reconstruction, and then received tamoxifen for 10 years. She presents for her scheduled follow-up. Her laboratory studies reveal a normal complete blood cell (CBC) count and CEA level, as well as elevated levels of cholesterol, thyroid stimulating hormone, and AST (64 IU/L). Her abdominal CT scan is shown. What is the next step in the management of this patient? Answer: B. Biopsy the liver. "A liver mass is defined as a focal solid or cystic lesion that can be differentiated from the surrounding liver parenchyma by imaging techniques." Widespread use of such imaging techniques for evaluating the abdomen has led to significantly greater identification and recognition of liver masses. The differential diagnosis is quite extensive, from benign asymptomatic lesions to malignant neoplasms, which may be diagnostically challenging for clinicians. Thus, obtaining a biopsy specimen from the liver with pathological analysis helps to determine the final diagnosis. Image from the National Cancer Institute (NCI). The patient's liver lesions are biopsy proven to be ER/PR positive, HER2-positive adenocarcinoma that is consistent with breast cancer. Which of the following is the best regimen for management of this patient? About 20-25% of breast cancers are HER2-receptor positive. HER2-directed treatments have been found to improve survival even in the metastatic setting. [7,8] First-line therapies for treatment-naive patients include monoclonal antibody therapy (trastuzumab, pertuzumab, ado-trastuzumab [TDM1, trastuzumab emtansine]) and/or tyrosine kinase inhibitor therapy (lapatinib) and/or chemotherapy with a taxane. [4,7,8] The American Society of Clinical Oncology (ASCO) recommends trastuzumab, pertuzumab, plus a taxane (eg, docetaxel, paclitaxel) for first-line treatment. Pertuzumab/trastuzumab/taxane therapy improves clinical outcomes compared with trastuzumab plus docetaxel. Evidence to support this three-agent combination comes from a phase III trial of 808 women with HER2-positive metastatic breast cancer who were treated with trastuzumab (8 mg/kg loading dose, then 6 mg/kg intravenous [IV]) and docetaxel (75 mg/m2 IV), and then randomly assigned to treatment with pertuzumab (840 mg loading dose, then 420 mg) or placebo. The results are shown above. Adapted images from MedPix | ENS Scott Liu, Russell A Patterson, Uniformed Services University. On follow-up, restaging CT scanning shows an interval appearance of three new low-attenuation nodules in the right lobe of the liver (top row; bottom row, left image) which are suspicious for metastatic disease, as well as several new mixed lytic and sclerotic bony metastatic lesions (not shown). (Bottom right image: Well-defined lucencies in the right iliac bone in proximity to the sacroiliac joint.) No worrisome pulmonary nodules and no lymphadenopathy are noted. The next step in the management of this patient should involve discontinuing the current treatment, and initiating which of the following treatments? Image from MedPix | ENS Scott Liu, Russell A Patterson, Uniformed Services University. ASCO recommends trastuzumab emtansine (ado-trastuzumab, TDM1) for second-line therapy. For third-line treatment, other HER2-targeted therapy combinations or trastuzumab emtansine (if not previously administered) should be offered, and pertuzumab may be offered if not previously given. Which of the following adjuvant therapy would you offer the patient in addition to her chemotherapy/targeted treatment for the bone metastasis? Image from Guzik G. J Orthop Surg Res. 2016;11(1):54. [Open access.] PMID: 27125184, PMCID: PMC4848795. For patients with bone metastasis from breast cancer, denosumab and zoledronic acid have each been shown to reduce skeletal related events (SREs) (but there appears to be no impact on OS). International practice guideline groups have not expressed a preference for either agent in the setting of metastatic breast cancer. However, although monthly denosumab may appear preferable to monthly zoledronic acid in terms of its modest SRE reduction, analgesic effects, and subcutaneous route of administration, the use of denosumab needs to be balanced with its increased direct drug costs. Bisphosphonates should be used with calcium and vitamin D supplementation. The anteroposterior pelvic radiograph is from a patient with breast cancer metastasis to the proximal femur and the acetabulum. A 65-year-old female with a negative family history of cancer presents with shortness of breath and a palpable breast mass. Biopsy of the breast mass revealed evidence of carcinoma. Pathological analysis showed a 3.5-cm breast mass that had no necrosis and was ER positive, HER2 negative (1+ by IHC). Her pulmonary CT scan is shown. Pleural fluid examination was consistent with breast adenocarcinoma with metastasis to the pleura. PET scanning revealed no evidence of metastasis in other body sites. This patient was treated with paclitaxel for 4 months. A 48-year-old-female presents with back pain. She states she was diagnosed with breast cancer in 2004 and underwent mastectomy, as well as received chemotherapy for approximately 8-9 months. One of the drugs may have been 5-fluorouracil (5-FU). She also took tamoxifen for approximately 11 years. In 2017, she first developed back pain. Which of the following does the image show? MRI of the thoracic spine demonstrated multifocal metastatic disease, and a PET scan revealed widespread osseous metastatic disease. There was no evidence of involvement of the lymph nodes, liver, or lungs. She received palliative radiotherapy to the spine with significant improvement in her back pain. Biopsy of several lesions showed HER2 negative, ER positive disease. She refused tamoxifen treatment and briefly received aromatase inhibitors with exemestane (estrogen modulator) and anastrozole (aromatase inhibitor); 6 months later, letrozole was initiated (aromatase inhibitor) because of arthralgia. She also received monthly denosumab. The following year, her imaging scans showed disease progression with new metastases to the sacrum and ribs. Which of the following would be her best treatment option? Image from Nieder C, Pawinski A. Case Rep Oncol Med. 2014;2014:931546. [Open access.] PMID: 24716053, PMCID: PMC3970251. Estrogen antagonist treatment (ET) (alone or in combination with targeted agents) is generally less toxic than chemotherapy; it is preferable for most patients with hormone receptor-positive disease to begin treatment with ET, reserving chemotherapy for patients whose cancers appear to be either refractory to ET or which have extensive symptomatic visceral involvement. Several studies have suggested that the addition of targeted therapies to ET improves PFS, although OS results remain pending. [16,17] Agents used for such targeted therapies include everolimus or inhibitors of cyclin-dependent kinase (CDK)-4 and -6 (palbociclib, ribociclib, abemaciclib). The abdominopelvic CT scan reveals hydronephrosis (white arrow) and bladder wall thickening (yellow arrow) (bladder catheter in situ) in an elderly patient with ER positive, HER2 negative recurrent breast cancer and metastasis to the urinary bladder. Image from the NCI | Daniel Sone. The time to start palliative care is as soon as a patient's cancer becomes advanced. For newly diagnosed patients with advanced cancer, the Expert Panel suggests early palliative care involvement within 8 weeks after diagnosis. Inpatients and outpatients with advanced cancer should receive dedicated palliative care services early in the disease course concurrent with active treatment. Image identifying a palliative approach in the literature from Sawatzky R, Porterfield P, Lee J, et al. BMC Palliat Care. 2016;15:5. [Open access.] PMID: 26772180, PMCID: PMC4715271. Ovarian Cysts: Functional or Neoplastic, Benign or Malignant? Disclosure: Winston W Tan, MD, has disclosed no relevant financial relationships. Disclosure: Matthew Tan, BS Biomedical Science, has disclosed no relevant financial relationships. Disclosure: Olivia Wong, DO, has disclosed no relevant financial relationships. National Cancer Institute. Surveillance, Epidemiology, and End Results (SEER) Program. Cancer stat facts: female breast cancer. Available at: https://seer.cancer.gov/statfacts/html/breast.html. Accessed February 5, 2019. World Health Organization. Cancer: breast cancer. Available at: https://www.who.int/cancer/prevention/diagnosis-screening/breast-cancer/en/. Accessed February 5, 2019. National Cancer Institute. Breast cancer treatment (PDQ)–patient version. Stages of breast cancer. Updated: February 1, 2019. Available at: https://www.cancer.gov/types/breast/patient/breast-treatment-pdq#section/_148. Accessed February 5, 2019. National Comprehensive Cancer Network (NCCN). NCCN clinical practice guidelines in oncology (NCCN guidelines): breast cancer. Version 3.2018. October 25, 2018. Available at: https://www.nccn.org/professionals/physician_gls/pdf/breast.pdf. Accessed February 5, 2019. Chalasani P. Breast cancer. Medscape Drugs & Diseases from WebMD. Updated: January 17, 2019. Available at: https://emedicine.medscape.com/article/1947145-overview. Accessed February 5, 2019. National Cancer Institute. Breast cancer treatment (PDQ)–health professional version. HER2/neu-positive breast cancer. Updated: January 31, 2019. Available at: https://www.cancer.gov/types/breast/hp/breast-treatment-pdq#link/_1491_toc. Accessed February 5, 2019. Cancer.net. Breast cancer – metastatic: types of treatment. May 2018. Available at: https://www.cancer.net/cancer-types/breast-cancer-metastatic/types-treatment. Accessed February 5, 2019. National Comprehensive Cancer Network (NCCN). NCCN clinical practice guidelines in oncology (NCCN guidelines): palliative care. Version 2.2019. February 8, 2019. Available at: https://www.nccn.org/professionals/physician_gls/pdf/palliative.pdf. Accessed February 8, 2019. Lofmark R, Nilstun T, Bolmsjo IA. From cure to palliation: concept, decision and acceptance. J Med Ethics. 2007 Dec;33(12):685-8. Slide 1: https://www.ncbi.nlm.nih.gov/pmc/articles/PMC4331823/, figure 1. Accessed February 5, 2019. Slide 2: https://www.ncbi.nlm.nih.gov/pmc/articles/PMC5373019/, figure 2. Accessed February 5, 2019. Slide 5: https://visualsonline.cancer.gov/details.cfm?imageid=2119. Accessed February 5, 2019. Slide 7: (Top left) https://medpix.nlm.nih.gov/case?id=c100e6f3-8ab5-4fe0-9fbf-e0f3739b694e; (top right) https://medpix.nlm.nih.gov/case?id=a803106f-0879-4bbf-8704-ba09ef52c316; (bottom left) https://medpix.nlm.nih.gov/case?id=3a73e117-6378-4b44-a806-31cf621b82e2; (bottom right) https://medpix.nlm.nih.gov/case?id=61f1c5ed-8ea3-4be5-9563-96b90ea1a5fa. All accessed February 6, 2019. Slide 8: https://medpix.nlm.nih.gov/case?id=61f1c5ed-8ea3-4be5-9563-96b90ea1a5fa. Accessed February 6, 2019. Slide 9: https://www.ncbi.nlm.nih.gov/pmc/articles/PMC4848795/, figure 3. Accessed February 6, 2019. Slide 13: https://www.ncbi.nlm.nih.gov/pmc/articles/PMC3970251/, figure 2. Accessed February 6, 2019. Slide 14: https://visualsonline.cancer.gov/details.cfm?imageid=8585. Accessed February 7, 2019. Slide 15: https://www.ncbi.nlm.nih.gov/pmc/articles/PMC4715271/, figure 1. Accessed February 7, 2019.